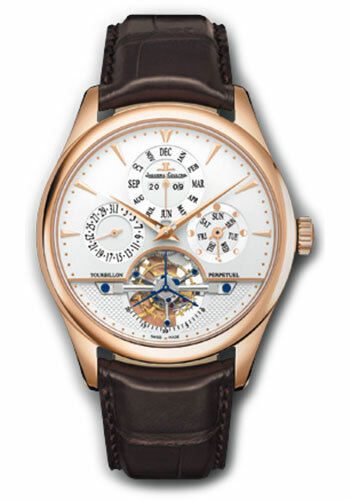 42mm 18K pink gold case, sapphire crystal back, velvet finished dial with partly adorned with a Clous de Paris hobnail motif, automatic calibre 987 movement with tourbillon, perpetual calendar, and moon phases, approximately 48 hours of power reserve, alligator leather strap with folding buckle. Water resistant to 5 ATM. 42mm Platinum case, sapphire crystal back, grey velvet finished dial with appliqued hour-markers, automatic calibre 987 movement with tourbillon, perpetual calendar, and moon phases, approximately 48 hours of power reserve, alligator leather strap with folding buckle. Water resistant to 5 ATM.